The story of India’s first recording star, Gauhar Jaan. India, Oct 1902. Fred Gainsberg is travelling across the country capturing the exotic sounds of the East on his miraculous new machine, the Gramophone. ?He hopes to record the beautiful voice of Gauhar Jaan, a young courtesan famed not only for her musical prowess, but her particular demands. Meanwhile, invited to play at a royal coronation, Gauhar’s requests see the Maharaja pull a trick that leaves her refusing to perform. Unhappy being a puppet of the court, Gauhar embraces the new recording technology that other artists have feared and becomes India’s very first recording artist. 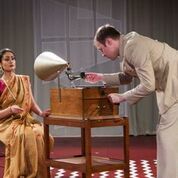 Gauhar Jaan is a musical play set in Datia, based on a true story of a courtesan whose beautiful voice Fred Gaisberg wishes to record on HMV record. Sheetal Kapoor (Gauhar Jaan) portrayed the arrogance of her character superbly. Daviesh Kishore's acting was very convincing as the king's servant. 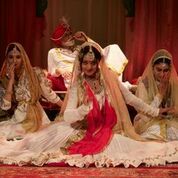 The sensual dancing and the lovely music created a beautiful atmosphere that transported the audience to the Durbar of the Moghuls of India, and that gives strength to the story. A recommended enjoyable and charming play.